The redesigned Wilma RX 14 HD Headlamp is a night-time game-changer. Boasting 4 high-end CREE LED's and an astonishing 3200 lumens, the Wilma is brighter than conventional car headlights. And, the high-quality aluminum body is now even more robust, more beautiful and above all more functional. More cooling fins prevent overheating. Wilma RX 14 has an integrated Bluetooth Module that allows easy control of up to ten pre-programmed light modes with the simple push of a button mounted to your wrist, or via the Lupine Smartphone App for Android and iPhone. Wilma's powerful illumination paired with a perfectly balanced luminous image allows you to indulge any activity at night, no matter how extreme or technical it is. Our Heavy Duty (HD) headband is lightweight and can be comfortably worn for long lengths of time, thanks to high-quality flexible textiles. The headband is constructed for perfect balance between battery and lamp head, so the weight is evenly-distributed on the head. Flexible, high-quality textiles ensure a secure fit on head, long-lasting comfort, and longevity of headband. Maximum stability makes this ideal for running, hiking, cross-country skiing, or camping. This HD Headband also has a special cable management feature, to feed the extension cable to a backpack or pocket. The long-lasting 13.2 Ah SmartCore battery not only powers your lamp, but empowers you by providing visual and audio signals of remaining battery capacity. 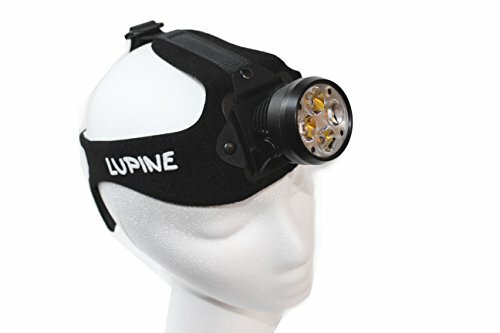 And, our extensive range of compatible accessories boost versatility, allowing you to transform your headlamp into a helmet light or handlebar-mounted light. This kit includes the Wilma R lamp head, Bluetooth remote, Bluetooth Remote wristlet mount, 13.2 Ah SmartCore battery, Headband, 120 cm extension cord, Micro Charger, 12V cable, Pouch L, and Manual.